Temarry Recycling has completed all of the legal requirements to transport hazardous waste to Mexico including RCRA, Non-RCRA and non-hazardous waste to our facility in Tecate, B.C. Mexico as specified in Title 40, Code of Federal Regulations, Part 262, subpart E, Section 262.53. This is evidenced by an Acknowledgment of Consent letter received from EPA commonly known as the AOC. There is an AOC for liquids and an AOC for solids. The AOC very clearly lists all of the federal waste codes that Temarry Recycling is authorized to export to Recicladora Temarry. As quoted from the letter, “This letter constitutes the EPA Acknowledgement of Consent for the export of the following hazardous waste as specified in your notice”. If it was not legal for Temarry Recycling to export the listed hazardous waste, EPA could not and would not grant the authorization. The letter certifies to the generator that EPA has done their due diligence to confirm with the government of Mexico that Recicladora Temarry has all necessary permits, is in good standing, and is authorized to receive listed imported waste. The diagram below illustrates the steps required for a company to receive an Acknowledgement of Consent from the EPA. By becoming the Exporter of Record, Temarry Recycling is the entity required to obtain all AOCs and complete the necessary annual reports. This is clarified by a memo from EPA stating the roles of the generator and the exporter. California State regulated waste requires that a Notice of Intent be sent to them specifying what is intended to be exported. Many are still under the impression that it is illegal to ship your hazardous waste to Mexico. It’s not only legal, but cost-effective and more efficient. 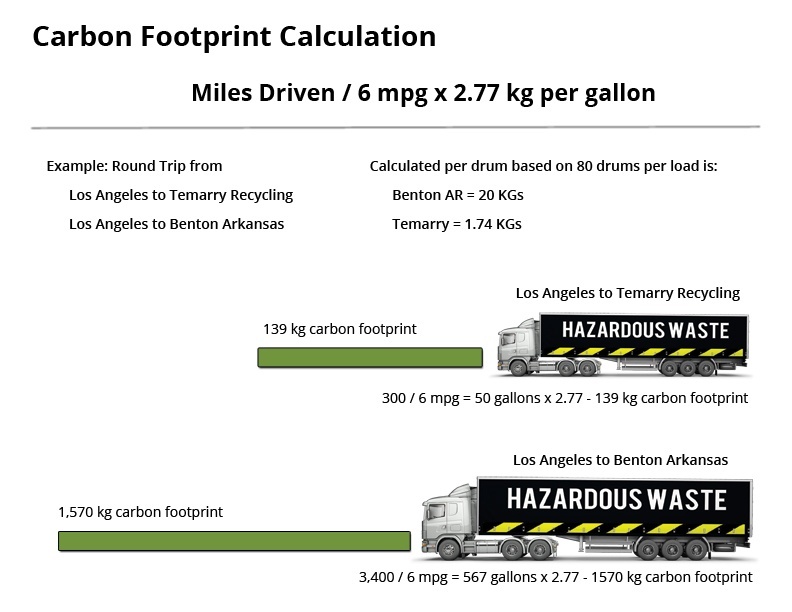 Visit our Free Carbon Footprint Calculator to find out what your business's carbon footprint is. The techniques used by Temarry Recycling Inc. include more than 40 years of experience in Chemistry and engineering. That expertise, combined with environmental consciousness and a genuine understanding of the economics of hazardous waste management, is our strongest product. Our goal is to recycle your waste in a legal, clean, sustainable and cost effective manner. reduces the amount of carbon footprint left behind.